Annual Fill the Boot drives heat up this summer to help bring strength, independence and life to kids and adults with muscular dystrophy, ALS and related diseases. 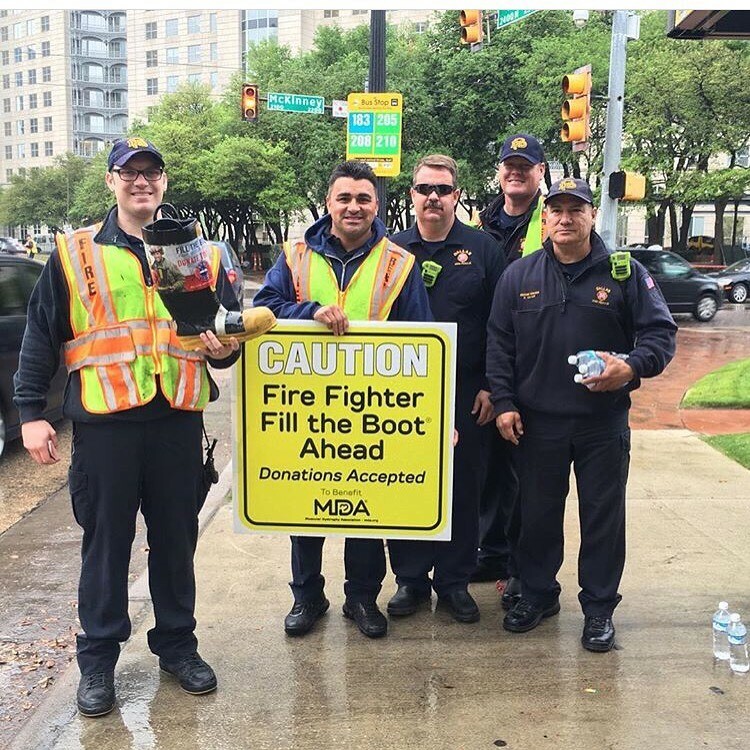 Fire Fighters from Dallas Fire–Rescue collected donations during the Dallas area Fill the Boot drive, MDA’s largest to date, to help support kids and adults with muscle-debilitating diseases. With help from the IAFF, we are able to help turn ‘cant’s’ in to ‘cans’ for the individuals we serve and we look forward to making more of these moments possible this Fill the Boot season, and for years to come. The Muscular Dystrophy Association and the International Association of Fire Fighters (IAFF) are heating up efforts this summer to find urgently needed treatments and cures for muscular dystrophy, ALS and muscle-debilitating diseases that severely limit strength and mobility during the 62nd annual Fill the Boot fundraising campaign. MDA’s iconic Fill the Boot campaign is an honored tradition in which thousands of dedicated fire fighters in hometowns across America hit the streets or storefronts asking pedestrians, motorists, customers and other passersby to make a donation to MDA, using their collective strength to help kids and adults live longer and grow stronger. (Click here to download broadcast quality Fill the Boot B-Roll). On June 20, MDA launched a new six-week summer campaign called Live Unlimited, inspired by individuals and families who are overcoming limitations and challenges every day. The essence of the Live Unlimited campaign is to start a conversation that shifts the focus away from one’s limitations to the power of possibilities. This idea is embodied by the IAFF and fire fighters nationwide, whose unwavering support continues to strengthen and support MDA research and programs for MDA families. 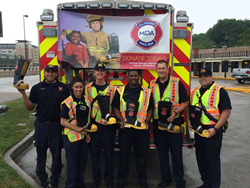 Nearly 580 Fill the Boot drives are set to take place across the United States by the end of July. MDA’s largest Fill the Boot drive consisted of 1,900 fire fighters from Dallas Fire–Rescue, including members from IAFF Local 58, who helped raise $519,000 to support local families with neuromuscular diseases. As MDA’s largest national partner, the IAFF has raised more than $583 million since 1954 to help fund the best and brightest scientists working to find research breakthroughs across diseases and uncover treatments and cures. In 2015, more than 100,000 fire fighters participated in Fill the Boot events across the country and raised $25.5 million. In addition to Fill the Boot drives, fire fighter contributions from year-round local events, include softball and golf tournaments, fundraising through marathons with MDA’s Team Momentum, joining MDA Muscle Walks, volunteering at MDA summer camp and more. Contributions help provide care and services, including state-of-the-art multidisciplinary care at a nationwide network of more than 150 MDA Care Centers, including 43 specialized MDA ALS Care Centers, as well as support groups and medical assistance. They also help send thousands of kids to “the best week of the year” at MDA Summer Camp at no cost to their families. The International Association of Fire Fighters represents more than 300,000 professional fire fighters and paramedics who protect 85 percent of the nation’s population. More than 3,200 affiliates and their members protect communities in every state in the United States and in Canada. Members of Dallas Fire–Rescue helped raise $519,000 during the city’s annual Fill the Boot Drive, MDA’s largest to date, to support kids and adults with muscle-debilitating diseases.